Former Black Sabbath keyboardist Geoff Nicholls has died after a long battle with lung cancer. He was 68. The news was confirmed by Sabbath guitarist Tony Iommi, who paid tribute to the man who first appeared with the band in 1979. 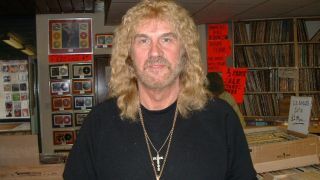 Iommi says: “I’m so saddened to hear of the loss of one of my dearest and closest friends Geoff Nicholls. He’s been suffering for a while now with lung cancer. Nicholls was originally brought into the band as a second guitarist and switched to bass following Geezer Butler’s brief departure. When Butler returned to the fold, Nicholls moved to keyboards and played on Black Sabbath’s 1980 album Heaven And Hell. He went on to play on the next nine Black Sabbath albums, his last being 1995’s Forbidden. Nicholls had been performing with former Sabbath vocalist Tony Martin on his Headless Cross project – and Martin says he was numb after hearing the news. Martin says in a statement: “Although I have known for some time of his cancer and spoke to him regularly through that period, our last conversation was just before Christmas. “He was resigned to his deteriorating health and wished me well. That was the last I spoke to him. I can’t tell you how much I am saddened by his passing – even though we knew of his diagnosis.